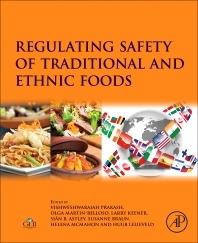 Regulating Safety of Traditional and Ethnic Foods, a compilation from a team of experts in food safety, nutrition, and regulatory affairs, examines a variety of traditional foods from around the world, their risks and benefits, and how regulatory steps may assist in establishing safe parameters for these foods without reducing their cultural or nutritive value. Many traditional foods provide excellent nutrition from sustainable resources, with some containing nutraceutical properties that make them not only a source of cultural and traditional value, but also valuable options for addressing the growing need for food resources. This book discusses these ideas and concepts in a comprehensive and scientific manner. Olga Martín-Belloso is Professor of Food Science and Technology at University of Lleida, Spain, and Head of the research unit Novel Technologies for Food Processing. Her research interests are focussed on the development of ready-to-eat, safe and healthy products by combining the already existing processing technologies with novel techniques, as well as the valorization of wastes generated by the fruits and vegetables processing industries. Pulsed electric fields, intense pulsed light and cold plasma treatments, modified atmosphere packaging, edible coatings, and nanostructured systems are among the key technologies developed by her research group. She led technology transfer to the industry in a center devoted to canned vegetables and supported the industrial implementation of HACCP and Quality management systems, while providing a boost to the innovative culture in the canned vegetables industry in Spain. She has authored more than three hundred research papers, several books, book chapters and patents. In addition, she has been invited as speaker in numerous international meetings and courses. She also belongs to the editorial board of recognized Journals and is associate editor of two of them. Dr. Martin-Belloso is member of several executive committees of international scientific organizations as the European Federation of Food Science and Technology (EFFoST) and the Nonthermal Processing Division of the Institute of Food Technologists (IFT). She is the Ambassador of the Global Harmonization Initiative (GHI) in Spain. Professor of Food Science and Technology, University of Lleida, Spain, and Head research unit Novel Technologies for Food Processing. Training and Communications Manager for EuroFIR AISBL supporting training within EU-funded research projects and networks and communication of research activities. Siân has worked extensively with individuals and organisations throughout Europe from a variety of disciplines including research, food and biotech industries and the media. Author of more than 300 popular science articles for magazines and trade publications as well as 25 peer-reviewed papers, and she was awarded her Diploma in Science Communication in 2009 (Birkbeck University of London). She is Editor of GHI Publications, including the GHI Newsletter. Dr. Susanne Braun is Managing Director of the Hohenheim Research Center for Bioeconomy, founded in April 2015. Dr. Braun has a broad knowledge in the food sector, based on an academic degree in food technology (MSc) and a second academic education in economy and European politics (MBA). Her work includes international management and consulting activities within food companies in different countries. She is highly experienced in working on international research projects and is involved in the coordination and management of EU research projects. She is a member of various European food networks and associations, such as EFFoST and IUFoST. Her main activities in recent years have included the optimisation of the knowhow transfer to SMEs in the food sector (several publications) and the linking with a trans-European network of various stakeholders in the food sector. Her work also included the organization of and participation in a large number of international conferences and workshops. Helena McMahon received a BSc in Biomedical Science from University College Cork Ireland, in 1999, an MSc in Molecular Medicine and PhD in Cellular Therapeutic from Trinity College Dublin in 2001 and 2007 respectively. Following Post Doctoral roles at Trinity College Dublin and Teagasc the National Food Research Center in Ireland, Dr. McMahon joined the Institute of Technology Tralee 2009 where she is currently a Principle Investigator within Shannon Applied Biotechnology Centre. Project protfolio an activities are focused in the fields of biotechnology, the bvio-economy and SME collaborative actions with a particular focus on innovation management and knowledge transfer.